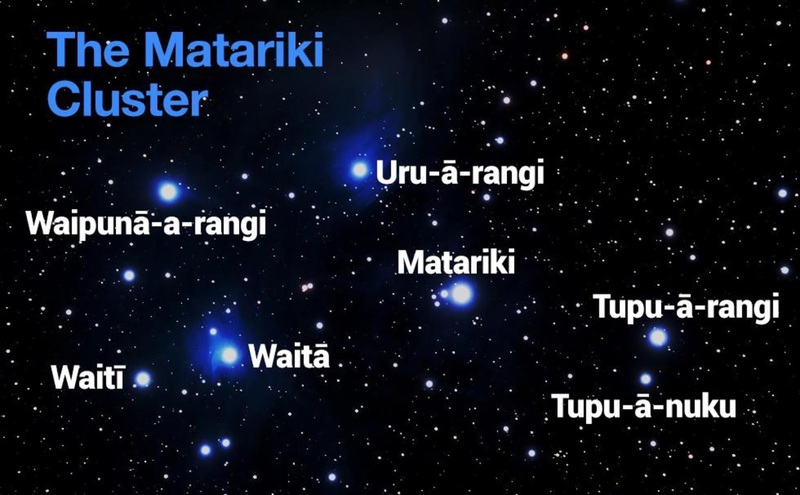 The star cluster known as Matariki rises during the cold months of winter, usually between the start of May and the beginning of June. Its rising signals the beginning of the Mäori New Year. About 500 stars make up the cluster, but only seven can be seen clearly with the naked eye here in Aotearoa New Zealand. Matariki remains present right through to March, when it disappears from the sky for two months, during autumn, before rising once again in the dawn sky. Early Mäori and Matariki The ancestors of Mäori used Matariki (as well as other stars and natural signs) to navigate across the Pacific Ocean to Aotearoa New Zealand. Here on land, Matariki was strongly connected to the seasons for harvesting and planting. The couple of months just before its rising were the season when Mäori would harvest and preserve birds and other food for sustenance over the winter months. Mäori astronomers used Matariki to identify if the weather would be good or bad for the coming season. Around the end of April, they would await the first rising of Matariki. Stars shining brightly signalled that it would be a warm year and that crops would be abundant. Blurry or dim stars were a sign that the year would be cold and that crops would be scarce. This also determined when crops would be planted for the coming year. The first sighting of Matariki was acknowledged and celebrated by a tohunga (priest) with karakia (incantations) to acknowledge the new year. Matariki was also a time when those who had passed away in the previous year were commemorated – a practice that continues today. Some iwi would lay down a small hängï to acknowledge the arrival of Matariki. They believed that, by checking how well-cooked the food in the hängï was, they could foresee whether it would be a good or a bad year. Chat Time - “Wh” is going on?